These worksheets cover shapes for kids in Preschool and Kindergarten. You'll find basic 2D shapes like squares, circles, triangles and more. If you're looking for help with more advanced shapes for older students, you will want to check out the 3D shapes covering cubes, cylinders, and pyramids among others. This particular lesson will focus on the square: how to recognize it, how to draw it, and how to identify it among other shapes and in everyday objects. Check out the shapes homepage (link at bottom of this page) for different shapes. 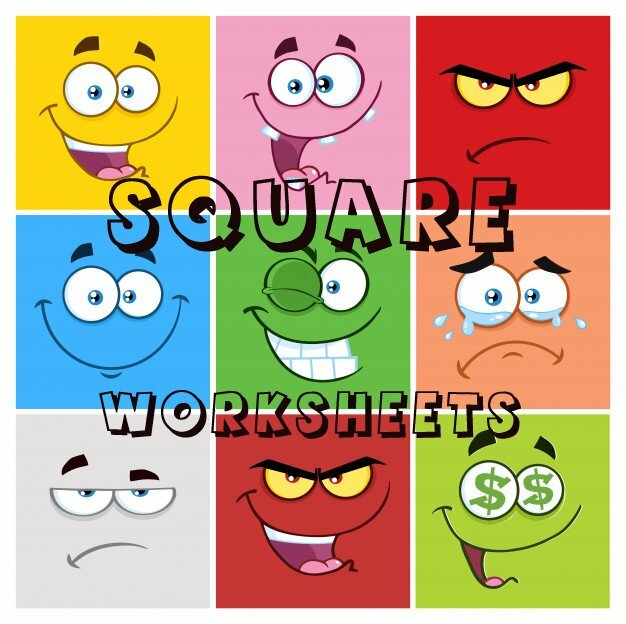 There are currently four different workpages focusing on square shapes. Each page has instructions at the top, but I will cover them in more detail below. Select an image to open and/or print. The first paper is a tracing and identifying activity. It is divided into two different parts. 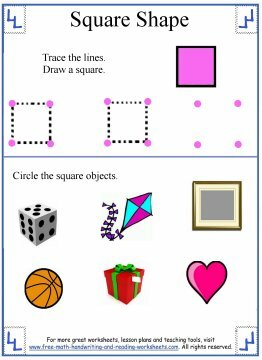 In the first section, have your child trace the square shape using the dotted lines and then draw one 'free hand' using the corner dots as a guide. Below that, there is a section with six different objects. Go over the items with your child, naming them and focusing on initial letter sounds. This doesn't have to be an activity just about shapes! Once you've labeled all the items, have your child circle the ones that are shaped like squares...or even better, have them draw a square around the items that are square. The next printable is a coloring task and will help your child to identify this shape among others. There are five rows with various shapes in each row. Have your child color in the squares. 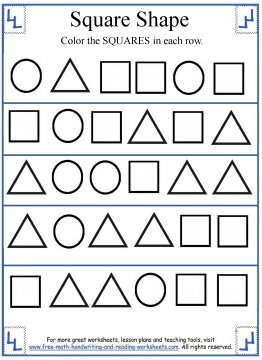 You could also adapt this worksheet to the other shapes as well, for example, have your student color all the squares red, the triangles orange, and so on for the other shapes. The third paper has three rows of objects. 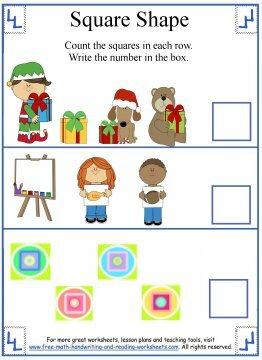 For each row, have your child count the squares and then write them in the box provided. The final activity is a maze. 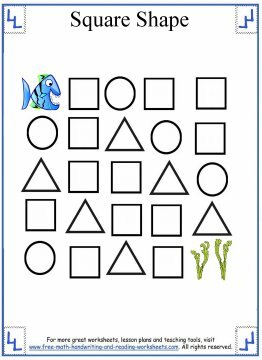 Move the fish from the top of the maze to her grassy house at the bottom by coloring in the squares to make a path for the fish to swim through.